Even the all-powerful pharaohs could not have foreseen how their civilization would endure through the centuries, enticing generations of travelers to discover its wonders. Like many of you, my fascination with ancient Egypt began as a young child during museum field trips, attempting to comprehend what daily life was like thousands of years ago. Egypt was a trip I thought to be out of reach given the unrest over the last decade. That is until my husband and I learned of a small group tour down the Nile hosted by Wild Frontiers, which planned the African safari of our dreams earlier in the year. We had also received rave reviews from recent visitors to Egypt, who spoke of the many safety measures in place, empty temples, and grateful locals. In 1997, tourism made up 9% of Egypt's GDP; in 2017, it was just over 3%, according to the WTTC Economic Impact 2017 Report. 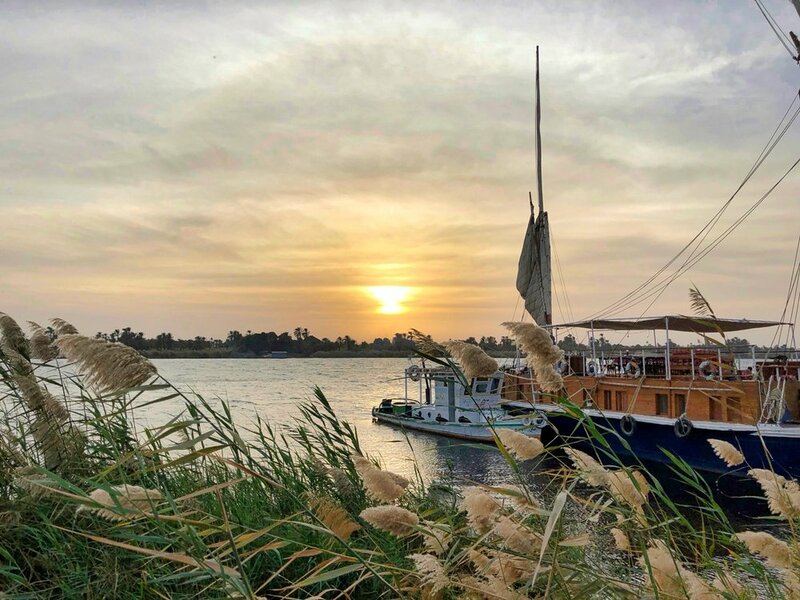 The Wild Frontiers itinerary captivated our imaginations, beginning in Luxor, then setting sail down the Nile towards Aswan. I pictured lounging on the deck of our 19-century style boat, gazing at ancient temples while village children waved to us from shore. With hats donned, we would bask in the warmth of the sun, pen long letters to loved ones, break for afternoon tea and listen to Agatha Christie share her latest mystery. The truth was not all that far off (unfortunately Agatha Christie did not join us, but our group of nine did include a songwriter). Dahabiya translates to 'jewelry box'. Tug boats help pull them along when the wind is down. Our guide, Mohammed, made a world of difference. With many hats to wear - translator, activity coordinator, hieroglyphic reader, personal shopper - he was generous with his wealth of knowledge and steadfastly upbeat, and we were thrilled to be his captive audience. Luckily our fellow travelers were just as inquisitive, eager to soak up every moment. While the unrest continues in parts of the country, I still urge you to make the journey and experience the wonders of Egypt for yourself. Artifacts and sarcophagi behind glass will never compare to the towering temples, fertile lands, and welcoming people. 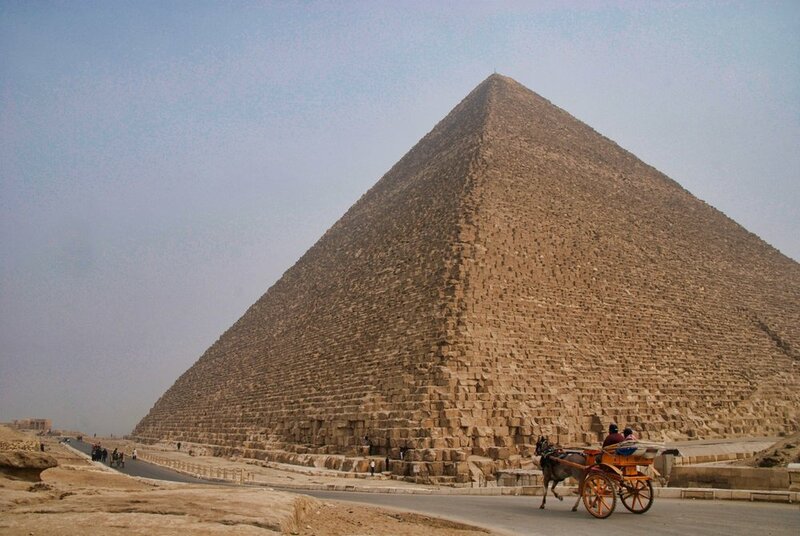 The Great Pyramid of Giza, built around 2,500 bc and the tallest manmade structure until the Eiffel Tower was built in 1889. You can visit the smal burial chamber inside but only after navigating several narrow and steep walkways, with extremely hot temperatures. Entering the Valley of the Kings Outside Luxor, the most famed collection of underground tombs in Egypt. 64 tombs have been discovered, the most recent in 2005, and some still believe there are more. The Tomb of Ramses IX in the Valley of the Kings, with several corridors leading down to this vestibule before descending into the burial chamber. Despite being robbed in antiquity, much of the artwork is preserved. 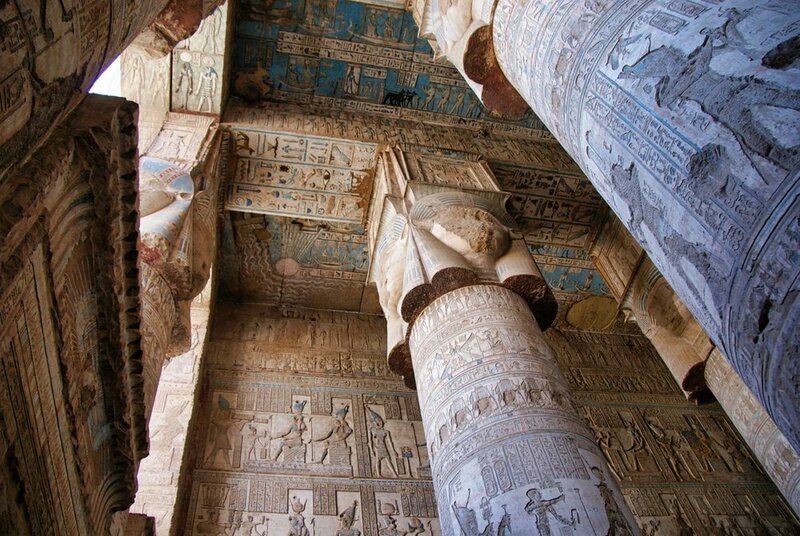 Magnificent Colors on display at the Temple oF Hathor at Dendera, north of luxor. Built by Roman Emperor TIberius in the 1st century ad, this hall includes carved scenes of Roman rulers giving offerings to Hathor, the cow goddess of feminine love and motherhood. 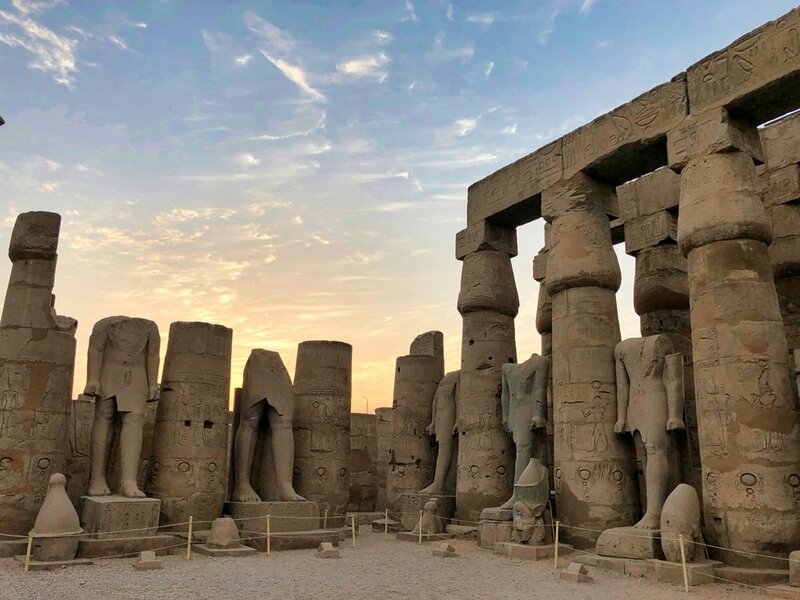 Sunset Tour of Luxor Temple, dating to around 1300 bc. When excavations began in the late 1800s, most of the temple complex was buried underneath sand and rock. 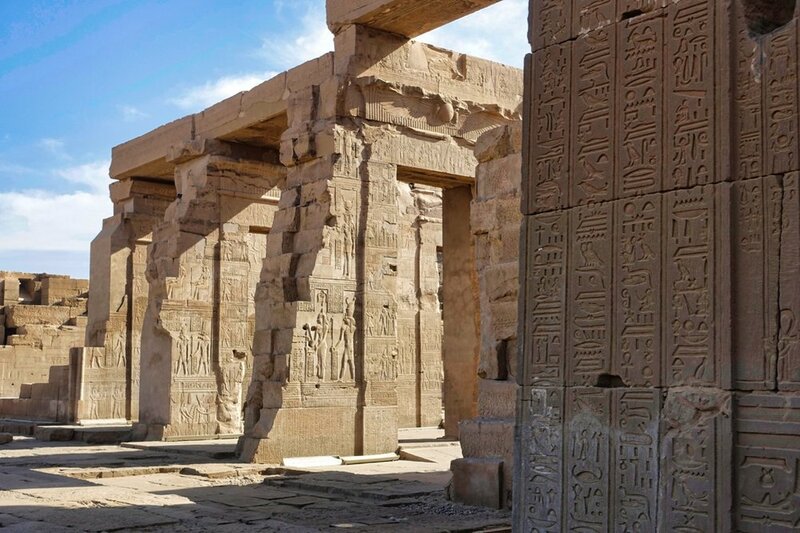 The Great Hypostyle Hall at Karnak, built around 1200 bc and located Just North of Luxor. 134 of these columns are arranged in 16 rows within a massive hall that was once covered. OUr Home On the Nile - A Traditional Dahabiya Boat. The upper deck had plenty of places to relax and admire the views, with a communal dining table. Each night we would moor along the banks of the Nile and continue our journey in the morning. Room with a View from our quarters aboard the dahabiya boat. Our boat had a total of six rooms, each with a tiny ensuite bathroom, plus quarters for the staff. Our Amazing Tour Guide, Mohammed, Taking Us to a local Village Along the Nile. Our tour included visits to several villages, where we met local families. 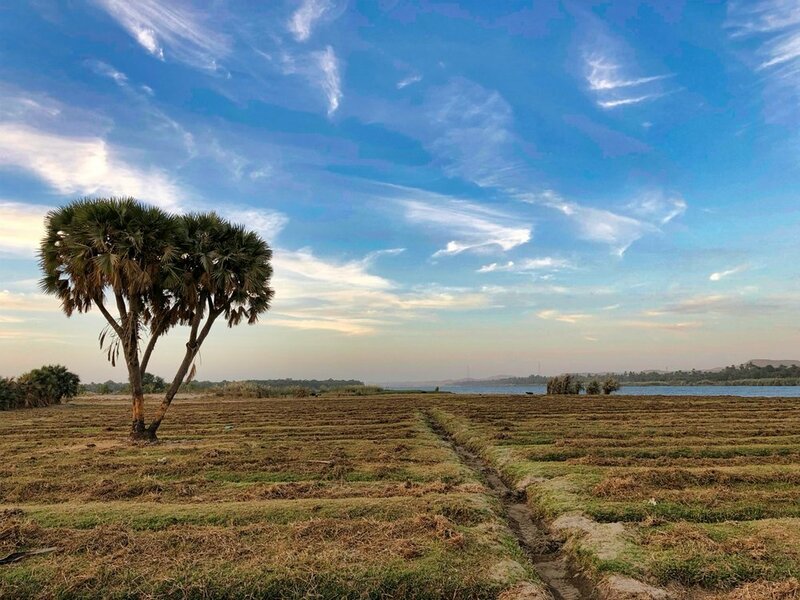 The Nile has always been the lifeblood of Egypt, and farmers continue to use it to irrigate crops. 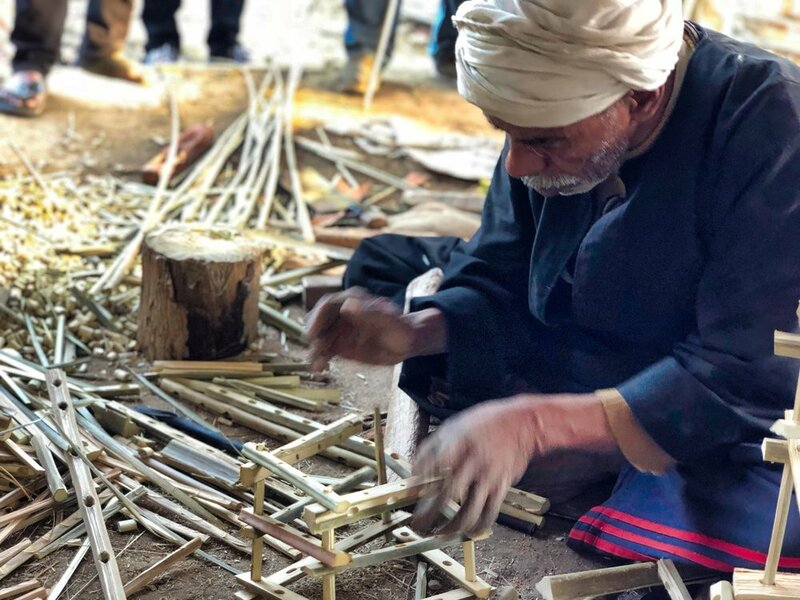 A Village Craftsman Making A special Box for us Out of date palms. Typically he creates larger boxes to transport crops such as tomatoes. The Temple of Kom Ombo, built around 100 bc along the nile. This is a unique 'double' temple with one side dedicated to the crocodile god, sobek, and the symmetrical other half dedicated to the falcon god, Horus. Trajan's Kiosk ('Pharaoh's Bed') at The Temple of Philae in Aswan. The entire complex was moved and reconstructed on this neighboring island in the 1960s to save it from an underwater grave due to construction of the aswan high dam. 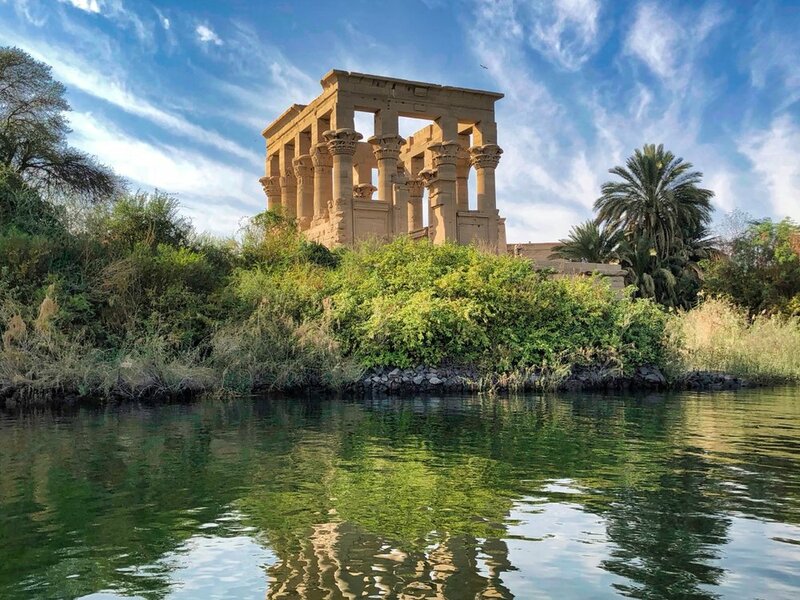 This is one of the most stunning temple locations in Egypt, surrounded by water and accessible only by ferry boat. An experienced travel agent or tour company can help make this journey of a lifetime come true. Here are the particulars of our Egyptian adventure. TOUR COMPANY: This was a 10-day group trip (minimum five guests, maximum 12) organized by Wild Frontiers, including all ground transportation, meals, and plenty of pre-trip information including packing lists and tipping etiquette. A small group size is helpful when touring the sites, especially the busier locations. SAFETY: We felt completely safe throughout our trip. At the time we booked our tour, the U.S. State Department travel alert cited the Sinai Peninsula, the Western Desert, and border areas as particularly dangerous, which are nowhere close to the places we visited during our tour. The major tourist sites had several security check points stationed before you even enter, including airport-style scanning. **TIP: Sign up for the Smart Traveler Enrollment Program (STEP) through the U.S. State Department, which provides regular updates and alerts from the local embassy. This program also ensures that the embassy has your information readily available in the event you need to be contacted. TIME OF YEAR: End of December, over the Christmas holiday. Winter in Egypt promises pleasant weather, with daytime temperatures in the 70s and 80s (F) and cooler mornings and evenings. Check historical weather for Cairo, Luxor, and Aswan. TRAVEL: The pace of the tour was perfect. We decided to add two days in Cairo to see some of the sites before our tour began in Luxor. From London, it was a 5hr flight into Cairo then a 45min taxi ride to Giza (plan on 1.5-2hrs during rush hour). From Cairo, it's a 1hr flight to Luxor, where our tour group met up and traveled around via small shuttle bus to see the sites before boarding the dahabiya boat to Aswan. We spent one additional night in Cairo before returning to London. 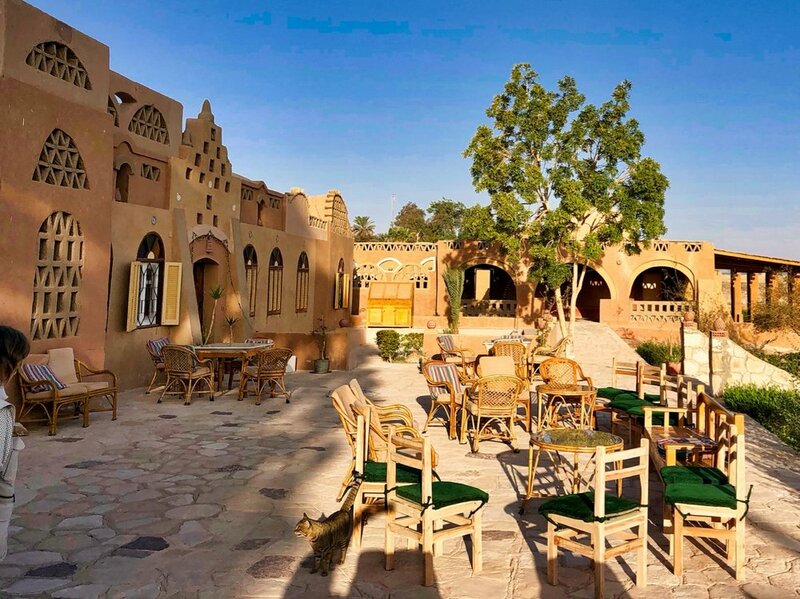 One could easily spend an extra few days in Luxor and Aswan, there is plenty to see and do. GETTING AROUND: All transportation was pre-arranged seamlessly and made it easy to access the sites, including a fun variety of transport options: shuttle bus, tram, tuk-tuk, horse-drawn carriage, and even a pickup truck. We typically spent 1-2 hours walking around the sites, but the terrain was mostly level and easy to navigate. Aswan - the grand Mövenpick Resort on Elephantine Island. 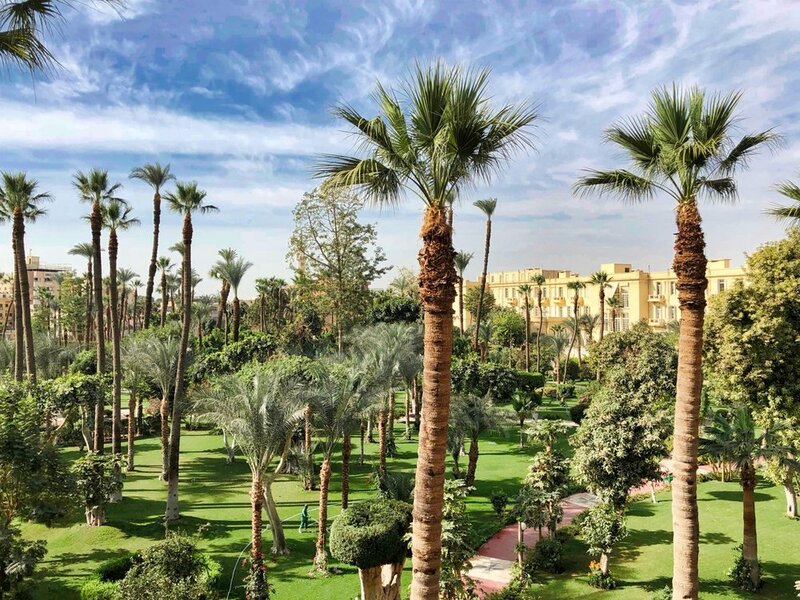 1 night // **TIP: If you're planning months in advance, try to book a room at the iconic Old Cataract Hotel, a Victorian-era palace where Agatha Christie penned Death on the Nile. Our guide said that rooms were fully booked nine months in advance. EAT: All meals were included in our tour package. Expect dishes with Middle Eastern, North African, and Mediterranean influences. One of our first meals on the dahabiya included roasted eggplant slices topped with garlic and herbs, a tagine of squash and zucchini, and stewed beef and rice. This self-guided walking tour takes you around The Forum and Palatine Hill, home to wealthy and powerful Romans of the day and where legend says that Romulus and Remus founded the city in 753 BC. Awaken your senses and ignite the imagination with an escape to a National Park. Packing is easy with the Compass & Key list of equipment and gear to make your day hikes comfortable and enjoyable. Share your travel tips and advice with fellow Compass & Key travelers in the comments below.